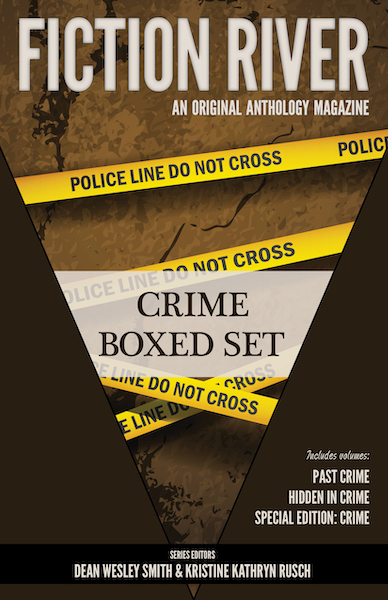 Enjoy some of the best short fiction being published today in this three-book bundle containing three crime volumes of Fiction River: An Original Anthology Magazine. This bundle includes: Past Crime, Hidden in Crime, and Special Edition: Crime. Edited by: Kristine Kathryn Rusch. Original stories by: Dory Crowe, Leah Cutter, Jamie McNabb, Dean Wesley Smith, Lee Allred, Richard Quarry, Lisa Silverthorne, Cat Rambo, Kris Nelscott, M. Elizabeth Castle, Michele Lang, and JC Andrijeski. Imagine paying a fine for walking across town. Or hiding an illegal marriage. Or losing your life for playing the harp. Strange crimes, dangerous activities, some from the not-so-distant past, return to life in Hidden in Crime. See why Publishers Weekly states “… fans of the unconventional will be well satisfied.” Join some of the best authors in the business as they uncover once-hidden crimes. Edited by: Kristine Kathryn Rusch. Original stories by: Annie Reed, Patrick O’Sullivan, Kelly Washington, Kris Nelscott, Tonya D. Price, Michele Lang, Cindie Geddes, Mario Milosevic, Debbie Mumford, Elliotte Rusty Harold, Angela Penrose, Michael Kowal, Anthea Sharp, Paul Eckheart, Bill Beatty, Dan C. Duval, M. Elizabeth Castle, and Ron Collins. From a twisted tale of greed by masterful writer Kate Wilhelm to a dark tale of murder and betrayal by Shamus-award winner Brendan DuBois, Fiction River Special Edition: Crime covers the entire gamut of the mystery genre—cozy to noir. New York Times bestselling author Julie Hyzy joins Edgar Award-winner Doug Allyn and several others to create one of the strongest (and most diverse) anthologies of the season. Edited by: Kristine Kathryn Rusch. Original stories by: Doug Allyn, Steve Hockensmith, Brendan DuBois, Kristine Kathryn Rusch, Julie Hyzy, Melissa Yi, Dæmon Crowe, Libby Fischer Hellmann, Karen Fonville, Karen L. Abrahamson, Kate Wilhelm, M. Elizabeth Castle, Annie Reed, Dean Wesley Smith, and JC Andrijeski.